Luxury One Bed Condo Directly Opposite Beach, Now Including Beach Set Up! Pamper yourself in our luxurious condo; enjoy morning coffee on the balcony while gazing directly at the azure waters and sugar white sand of the Gulf of Mexico. Beach Set-Up, (2 Chairs and One Umbrella) is included in the rental fee. Our unit is located on the 2nd floor at the west end of the buidling right opposite the beach - this affords wonderful sunset and gulf views and gives the unit a light airy ambience due to the additional natural daylight from the west wall window. It's only around a one minute walk from our front door to our private beach access! The unit features a contemporary remodeled kitchen & bathroom; granite surfaces; tiled floors; fully enclosed cultured marble tub/shower. Gated access to private beach. 40" flat screen smart TV; 20' flat screen / DVD in bedroom. King size bed and sleeper sofa. Two pools(one heated seasonally),and hot tub. Wireless internet access is included in the rental fee. Miles of beachside sidewalk and cycle paths. Beachside restaurants within walking distance. Silver Sands Outlet Mall and Destin Commons Open Air Mall and Movie Theater are each only 5 minutes drive away. Multiple Destin attractions nearby for families with children. If you need help making up your mind please take a minute to review the Guest Comments by clicking the link above. A deposit is payable at the time of booking. Final payment is due no later than two weeks before arrival. I started vacationing on the gulf coast a few years ago with my wife and children and could not believe the perfect white sand and clear blue water; so different from the pebbly beaches and gray/green water of the south coast of England where I grew up. 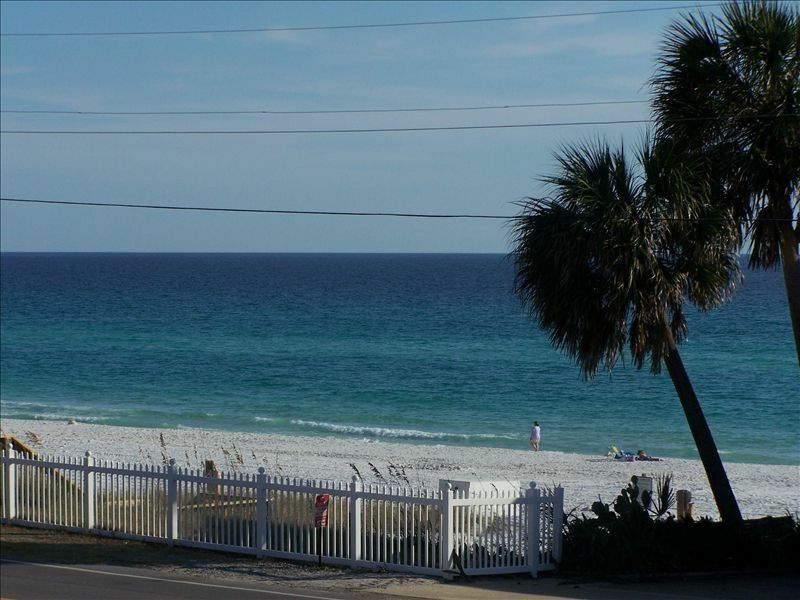 My co-owner and work colleague Bill Pickett grew up enjoying many family trips to Panama City from his native Atlanta and so he was well aware of the charms of the Emerald Coast. Condo was nice and clean, perfect for a couple, and had a lovely beach view from the 2nd floor balcony. Convenient to restaurants and steps from the beach. I will definitely look for this unit again for my next trip to Destin! We loved staying here! Our favorite rental in Destin yet. The area is quiet and relaxing, but still walking distance to a bunch of restaurants. The condo had a great view from the balcony. It took only two minutes to walk from the front door to the beach. The condo was spotless (and I am really picky with cleanliness!). We would love to stay here again! The condo was very clean & was well stocked on kitchen items. The king size bed was comfortable. The condo was decorated beautifully. Our only complaint was the washer & dryer was not in the condo. It was a community one on the 1st floor & only took quarters. There is no change machine either so trying to find someone to get change is rather challenging. Thanks for your kind review. The washer and dryer machines are actually equipped to accept payment by card. Receipt of refundable $200 Deposit will hold your dates. First Payment is due 60 days before arrival. Remainder is due 14 days before arrival.